Though known for being scavengers, spotted hyenas are also highly efficient predators. 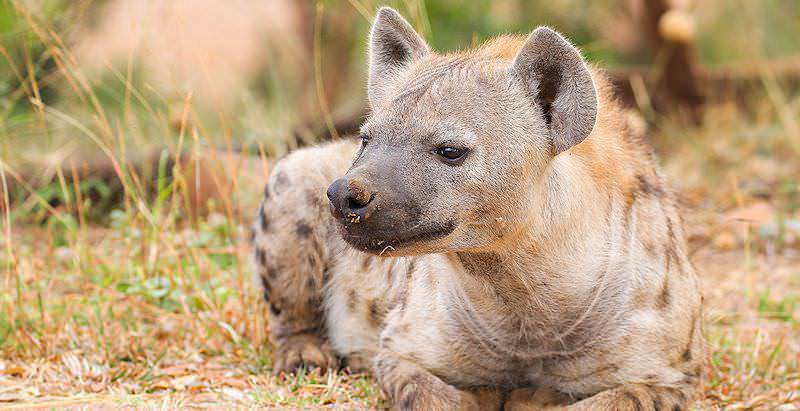 Spotted hyenas are a light yet dull brown color mostly, with darker dots or spots of fur scattered randomly over their whole body, giving them their name and also helping them to camouflage within the savanna areas of Africa they so very often frequent. Their tails and the hair on their back is also a darker color. They are quite large and are some of the alpha predators and scavengers of our grasslands, with males weighing between 40 and 55 kg (88 and 121lb) and females a bit larger at between 44,5 and 63,9 kg (98 and 141lb). Spotted Hyenas are very widely distributed within Sub-Saharan Africa, with the only major exclusions being the heart of the rainforest and the coast of West Africa more north in Africa, along with scattered areas of Namibia and Zimbabwe more south. They are also absent within the largest part of South Africa which includes the Cape Provinces and mainland areas mostly used for agricultural activities. They are continuously found from northern South Africa right up to parts of Sudan on the East side of Africa, with the West a mirror of this picture for the most part. Spotted Hyenas are the main larger scavengers who prey upon the kills of lions or leopards. They are very common and are in no danger or threat now, coming out in numbers during the early hours of the night, but are rapidly decreasing in numbers as well due to the same things that affect other carnivores, poaching among other things. They have their wide range of distribution on a positive note, and occupy areas lower than 4100m in these countries. Their total population size is estimated at between 27 000 and 47 000 individuals, of which around 1 300 to 3 900 can be found in the Kruger National Park. The spotted hyena is one of the main characters in the epic events that occur on the great grasslands of Africa, where big hunters and big prey battle it out. This is where they flourish in great numbers, although they are sometimes found in subordinate and smaller areas of woodland, grassland or savanna and bushveld, where they hunt more often due to the lack of big kills but avoid environments like these as far possible. They consume the most meat of all hyena species, and rarely show any signs of being an omnivore by eating insects or even wild fruits. They take up the role of bottom feeders, scavengers and runner’s up to great prides of lions in a typical intense African battlefield found on the Great Plains. In areas where lion populations have been depleted, the tables have since been noticed to turn, and Spotted Hyenas have indeed become the primary hunters in an area, largely because of their strength in numbers. They form large clans of many individuals of which the majority are female, all led by a matriarch or dominant female hyena. They all live together in a series of shelters collectively called their den. They are less open and social when it comes to things like raising young, where every female sees to the health and wellbeing of her cubs alone, rather than one large communal effort to raise young. Hyenas do form these groups known as clans, but are still territorial and spend a portion of their time on scent marking through defecation and pasting and compete with one another when stumbling upon a kill. They also have a unique way of greeting where members exchange sniffs of each other’s behind that is done as a kind of ritual each time. When competing for kills or communicating over a distance hyenas send out their signature laughing sound whilst keeping their head faced to the ground as they do so. This whooping sound has many variations depending on pitch and is one of the few growling, giggling and laughing sounds they create. Spotted Hyenas reproduce at any point throughout the year when females go into heat for a 2 week long period. Both males and females reach sexual maturity at around 3 years of age when they are able to reproduce. Their pre-copulatory rituals are not of the glamorous kind; males generally get the confidence to mount a female and are either met by an aggressive or mutual response where the male then either continues or stops and moves away. After a female conceives, it may take up to 132 days for her to finally give birth to her litter of new clan members, ranging from 1 to 4 pups, but usually 2 on average. Spotted Hyenas aren’t generally tormented by the thought of predators or attacks when they retire to their den to rest, but they do face competition for kills and meat from other large predators like lions, although they are usually the ones who make a nuisance of themselves. They often steal leopard, cheetah and even lion kills if their numbers are enough for them to prevail, and sometimes get themselves into epic battles in dry periods when meat is a scarce commodity because of this. Their main strategy when defending opposition is to gang up on them in numbers. South Africa's most sought-after destinations include Kruger Park and Cape Town. Botswana offers the exciting opportunity to enjoy water-based game viewing. Travel to Namibia for thrilling desert-based activities like hot air balloon safaris. Zambia is home to safari areas like South Luangwa, Kafue and Lower Zambezi. Zimbabwe's truly wild wilderness areas include Hwange and Mana Pools. Mozambique offers the quintessential African beach vacation. The Kruger National Park is Southern Africa's top Big Five safari destination and offers a wide range of accommodation options. The Sabi Sand Private Game Reserve conserves 65 000 hectares of pristine lowveld along the border of the Kruger Park. Cape Town's top attractions range from the iconic Table Mountain to the historically significant Robben Island. The Garden Route region stretches from Mossel Bay in the Western Cape to Storms River in the Eastern Cape.